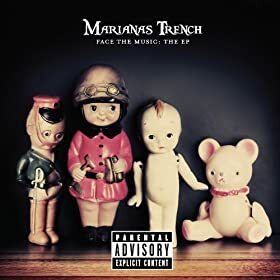 Canadian pop-rockers Marianas Trench released a four song EP last week titled, Face The Music. The EP, which includes two previously released songs, 'Desperate Measures' and 'Haven't Had Enough,' along with acoustic versions of 'Fallout' and 'Haven't Had Enough.' Although hoping we might have been given a glimpse into some new material, this EP features some good work. With a steady beat, sweet harmony and electric feel, 'Desperate Measures' is a must have (if you don't have it already). 'Haven't Had Enough' has the same sort of vibe as 'Desperate Measures' - mainly a pop tune with catchy lyrics. It is very upbeat with a beat comprised of an electric feel within the music. The two acoustic songs really stand out as we have never really heard soft spoken songs from this band. Most of their tunes are upbeat pop with the acoustic version of 'Fallout' particularly standing out. The song has a lovely string of an acoustic guitar that starts the song off and then runs throughout the whole song. Possibly the best thing about this acoustic tune is that it really showcases frontman Josh Ramsay's natural vocal talent and it gives you the chance to actually hear his vulnerability that relates to the lyrics and message of the song, something you cannot hear as well in the original version. The acoustic version of 'Haven't Had Enough' doesn't differ too much from the original. The song features softer guitar and guest vocals by another member of the band and a nice beat by a maraca. There are also a few points in which the whole group harmonizes together. If anything, Face The Music is worth it just for the the two acoustic versions as they are the most unique and are something you might not expect to hear from such a pop/electric influenced band. 'Fallout' acoustic is a really a gem and piece of art released by the band so take a listen! Face The Music: The EP is out now via Cherrytree/Interscope Records.